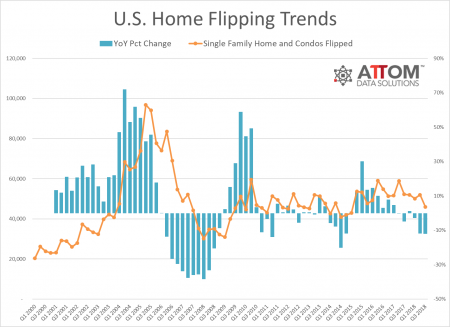 A cooling housing market has pushed U.S. home flips to its lowest level in over three years, according to a new report from Attom Data Solutions. Over the past nine months, a total of 45,901 homes were flipped, which represented 5.0 percent of all home sales — a 0.2 percent quarter-over-quarter and a 0.1 percent year-over-year decline. The numbers are a stark change from May and June of this year, when the home flipping rate hit its highest levels in years. “Home flipping acts as a canary in the coal mine for a cooling housing market because the high velocity of transactions provides home flippers with some of the best and most real-time data on how the market is trending,” said Attom Data Solutions Senior Vice President Daren Blomquist in the report. In Q3, the average gross return-on-investment (ROI) for flipped homes dipped to 42.6 percent, marking a 1.5 percent decline from the second quarter, and a 5.5 percent decline from this time last year — the lowest seen ROI since 2012. Despite this, investors at the higher end of the market are still raking in the dough with the average gross ROI for homes priced $5M+ reaching 186 percent. This past quarter, the percentage of homes purchased with financing dipped 1.9 percent quarter-over-quarter, to 38.8 percent, a reversal of the previous quarter when investors shied away from all-cash deals as purchase prices began to rise. Although the home flipping market is tough in much of the country, investors are finding success in Pennsylvania, Ohio, Kentucky, Louisiana and Michigan. In the third quarter, Pennsylvania (96.7) and Ohio (90.4 percent) continued to yield some of the highest average gross flipping returns on investment.